After a good nights sleep and and even better night being wined and dined with Joanne, Claire and I set off just before the daylight broke. We were leaving Sue behind again today but she was going to join us for the last 6km for climb up to and through the Portfofino National Park. The air was cool but not cold and we sat outside for breakfast at a little cafe near Piazza Mazini. We popped our heads into the Signora dell'Orta Cathedral with exceptionally large frontage and rather too much, inside less opulent. Our journey continued to weave through the suburbs, eyes fixed to the pavement to avoid doggy landmines that have been unfortunately all to common on our walk so far. 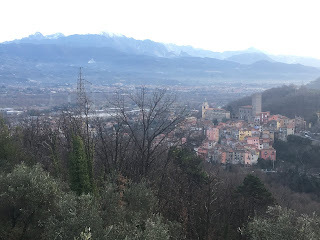 After a quick climb up through the woods and past a world war 2 bunker we reached the Sanctuary delle Grazie that provide unspoilt views back to Chiavri. After taken advantage of a water fountain we pressed on all the while slowly climbing before levelling off to reach the church of San Pietro in Roverto. Steps both up and down have become our usual way of traveling on this voyage of discovery and today was going to be no exception. Unfortunately I had committed to start counting them before we set off on day 1 and I was not going back to start again. 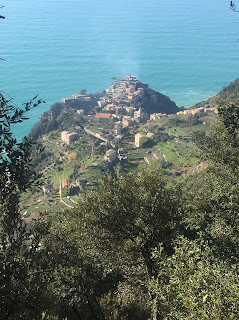 We descended, yes down steps, weaving along a small alleyway that eventually brought us the the town of Zoagli, gazing in wonder as our walk notes had told us to as we descended down steps from above another church. Crossing the Piazza children were laughing while they enthusiastically played football and another group of smaller children sat patiently on a wall waiting for their teachers next instruction. 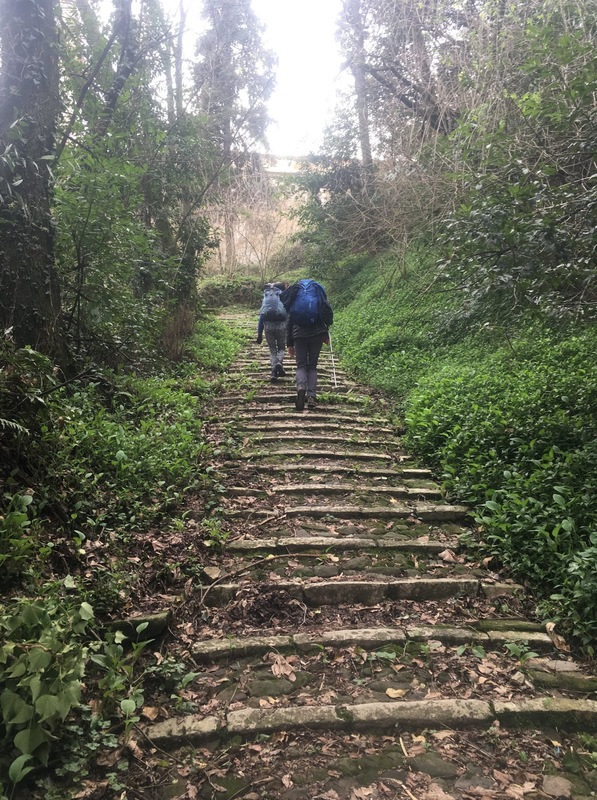 We passed through up more steps and then along an ancient cobbled pathway set in the olive groves of a peaceful hillside. It was nice to be at the top as it was easier on the legs, the steps are starting to take their toll, certainly for me. We weaved our way around the winding road, with olive groves and vineyards scattered in the hillside, before descending into Rapello. Rapello is another of the sea fronted towns situated in a large cove but had clearly once been a main thorough fare for the Romans. We passed the very large single span Roman Bridge called Annebel, not sure why that is but it is a nice name. 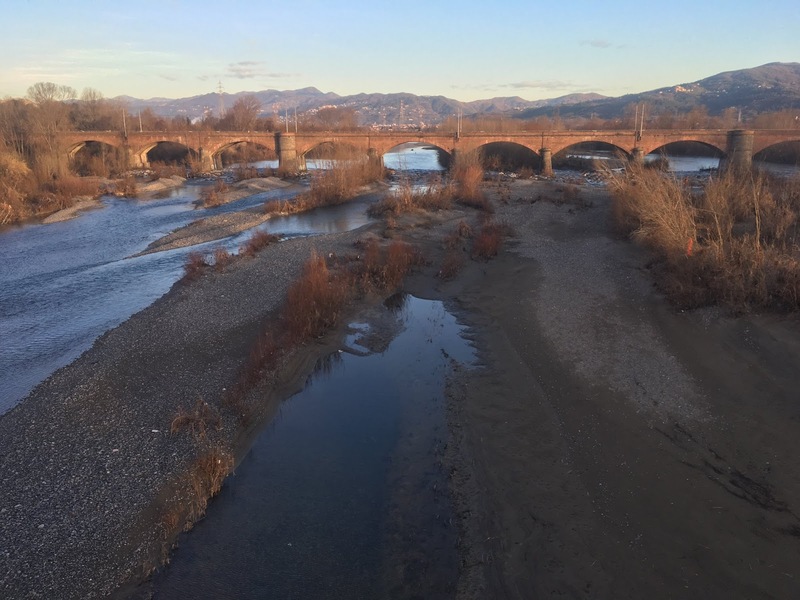 It is reputed to be more than 1000 years old and at one time had a river passing underneath it, unfortunately and very sadly it is a busy road. In Santa Margherita (14 km) Sue joined us and we all sat and relaxed in the sunshine by the marina eating our lunch. There was a bit of a nip in the air so we did not loiter too much. With one more hill, and a big one - 500m, Sue removed the extra 2 kilos she did not need to be carrying and passed it onto me. Yes, chivalry is not dead yet. The journey was arduous to say the least and in places very steep and interspersed with the odd group of steps. We steadily made our way up through the Portofino National park, part way up heading layers as the combination of the humid air and sunshine rapidly heated us up to near melting point. At the top we were expecting fabulous views but all we saw was the way we had come and if there had been a more direct path we could have saved time and distance. By a strange small wetland area that had been created by the side of the path, we turned left and made our slow descent to the end of the day. 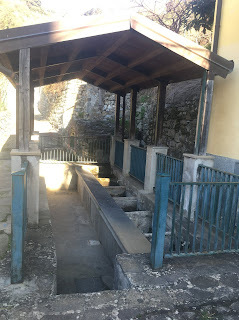 Passing a small shrine and a picnic area side by side the walk notes had mentioned passing ceramic polychrome of Via Crucis! In English this turned out to be religious shrines depicting scenes from the bible, all completed in ceramic mosaic tiles. The final part of the day saw us winding down a very steep path through small clusters of houses only accessible by the path. Part way down we had to step t once side as a moped came hurtling down the hill with a small child on. Fortunately the path has a small slope on side for such purposes and although I can ride a motorbike, I don't think I would have liked to be going up or down the path on one. Tonight we are staying in an apartment with a balcony and sea view and I think Claire is coming down with Sue's lurgy as she is tired this afternoon. Just a fantastic evening being wined and dined. I had been corresponding with somebody who had walked part of the Via della Costa as we were doing, and they lived in Chiavari. Tonight we were having our evening meal provided by somebody who had also walked the same path we were currently completing and a former Pilgrim. I'd been corresponding with Joanne (originally from Canada) about our walk, my walking business and had been invited for supper. At 6.30pm laden with our gifts of wine an apple cake we met Joanne in Piazza Manzini and were promptly taken back to her apartment. The evening was an absolute delight, with shoes off and coats hung up we were whisked into the kitchen and sat round the table and just talked about walking and life in general. Not only was she a translator but a flute player for a rock band.....And, it is such a small world that she had been born in Leeds - 15 miles from where I live and 20 miles from Claire. 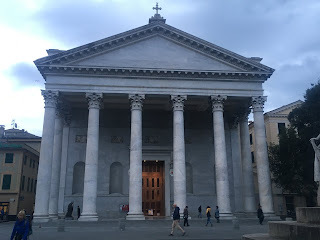 Joanne had many tales to tell of meeting and walking with Pilgrims and their experiences, all of which were very familiar to Claire and I after our journey from Rome last year. The night revolved around eating several bowls of home made hearty soup and fresh breads, a fresh walnut salad, followed by our own apple cake. All washed down with our red wine, which I think Claire was disappointed with because she couldn't find one for €10 or more and it wasn't a superiore. Joanna supplied a bottle of their own red wine from their small vineyard which made ours look like Aldi's own brand grape juice. I think we could have talked all night and probably might have, but Sue was visibly wilting with the lurgy so we drew the night to a close. It's experiences like the one we had just received really demonstrate how nice some people can be. As total strangers we were made so welcome and I'm sure we left as friends. We hope to reciprocate when Joanne comes to England. Sue was definitely under the weather and with the lurgy she decided to not walk and continue by train to Moneglia. Claire and I popped next door to the bar for our now regular Cornetto (croissants) a la creme's and coffee and with breakfast over, fresh bread and focaccia for elevenses to nibble on, we were walking along the promenade of the seashore. After just 10 mins we were once more climbing steps and ascending from sea level to about 200m. After crossing a road we headed downhill on steps and then narrow pedestrian streets. The guide notes which I'd loosely translated into English mentioned passing villas with gardens of beautiful blooms......mmm it's winter what should we be seeing now we both questioned. 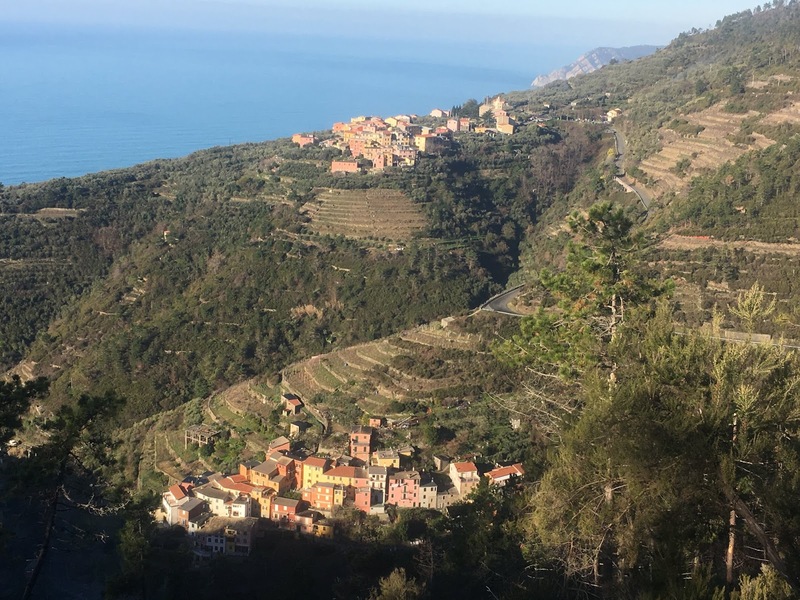 We quickly passed through Bonassalo and once again we were soon climbing the hillside and passing through the scrubland. As our path turned the corner of the headland the sea unfurled far below us, a vivid turquoise blue in the sunlight. Our path took us very, very close to the edge of the cliff and as Claire got her phone out to take a photo, it dropped out of her hand. It skittered and bounced forward getting closer and closer to the edge and then over to thankfully come to rest at a thorny bush. Claire gingerly made her way to retrieve it and yes as I write this she is still with us and did not fall over the edge. It is difficult to put into words just how spectacular this section was and how narrow in some places it was. It has to be experienced, but you have to like heights. What ever goes up always has to come down, I think I'll mention that to Archimedes. At the end of our path we descend a very steep, rocky path, very very slowly, passing through the Valley of the Blades and back along the cliff top to Framura. No sooner we were down then we were back up again, passing through the sleepy hamlet of Anzo before climbing a monster set of stairs that just went on and on. Thankfully at the top there was a picnic bench but no oxygen tanks to replenish the lungs. After a much needed rest we meandered along typical Ligurian narrow pathways through Ravecca and Sette two more small hamlets. The latter with an ornate Lavoire (Wash house). We continued to climb and at the top met several gunmen out shooting, I assumed wild boar.....anything that moved. A walker, who passed us by said "Don't worry they don't shoot foreigners". Mmmm were not convinced! At the end of the track we descended a very steep, rocky, slippy path. Part way down we met someone that we thought was maintaining the path. We exchanged the obligatory Buongorno's and it transpired he was making soil ramps for his mountain biking friends.......I politely mentioned that he was loco. How and why do people come down such ridiculous terrain on a bike? Probably because it's there. 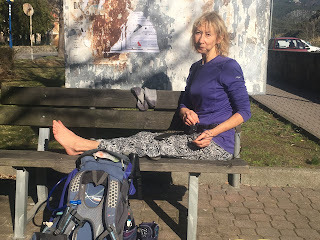 Once on level ground we progressed into Deiva Marina, found two benches, one each and with boots and socks off we had lunch. It is so refreshing to have your hot sweaty little piggies kissed by a gentle breeze while you rest. After a decent break we redressed and burst forward for our final ascent of the day - 2km uphill from sea level to 350m. Our path initially was on a concrete road but at the end we headed into the woods and up again. We had mentioned to Sue what our route would be and how long it would take and at the top..........there she was. After squeals of delight from all of us, we made our way, all together down to Moneglia, happily chatting away once more. We woke before the dawn had broken and soon into the Pilgrim routine of packing the rucksack, ensuring nothing was left behind whilst for some of us drinking strong Italian black coffee. For me there's no other way to drink coffee. By 7.30 we were bidding farewell to our lovely abode, made even special by our next door neighbour, Marco popping round the previous night to welcome us to the village. Our path continued up and up the hillside, through Caprena and at the saddle of the hill we met up with a local hunter. After some Italian exchanges he pointed us in the direction of Volastra. 1km later at a path junction I checked my GPS as there were no signs for our route. It transpired that we were heading in the wrong direction. It probably was another way to the village but not the one we wanted. We returned to where we had just come from and although he was still there, he seemed to ignore our presence. At the right path we took the steep decline down a cobbled and broken stone path. It was well into midmorning and the with the sun high in the sky the temperature was climbing. At the bottom of the hill we reached a wide level track and followed it to the end. In Volastra (10km) we went in search of a cafe but it is not tourist reason and everywhere is closed up until March. At the local mini market we bought supplies for lunch and an espresso and returned to the Piazza of the church to rest and have second breakfast. 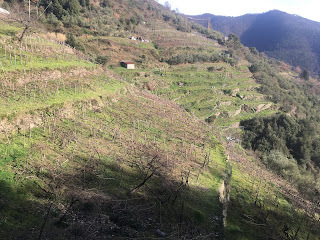 After 15 mins and much faffing by all of us we were soon on our way and our journey continued along the narrow terraces of the vineyards that hugged the cliffside with the sea glistening in the sunlight far below us. Soon there was an almost vertical ascent up the into the wooded hillside to reach the main rd. At the top we rested, naturally, Sue was having problems with a blister and decided that as there was another 18km ahead she would call it a day. Claire decided to keep her company and I pressed on eager to finish the day before it got dark. After a section along the road I was soon heading into and around the wooded ravines and the 4km along it was hard and very strenuous with some very steep climbs and the odd stream to cross. Back on the road I visited the Convent of the Maddona of Reggio situated well away from the road sleepily sat on the side of a hill. This would be a good place to return to and stay the night. There was even a little cafe open but I did not have time to stop. With 10km ahead of me I pressed on as it was 14:30. Back on the road I made good time and after a further 150m of ascent I was finally descending towards the end of the days walk. At the Convent of Soviore I decided that I need to rest my feet and refuel. With boots & socks off, feet up on a bench I dined on bread and cheese and my goodness it tasted so good. 10 minutes rest was too much time wasted walking but much needed and with boots on once more I marched on. I had walked the route virtually at home in the office using google maps and street view so I knew I was nearly home for the night. After one finally section on the main road I was soon back in the woods on a dirt track which was slightly more comfortable on the feet and arriving at Fontona. 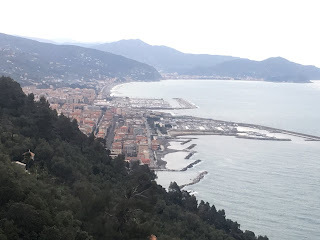 From that point I relaxed knowing that the last few kilometres were along the suburbs of Levanto and so if it got dark that was ok. I'd tried to contact Claire to let her know of my progress and enquire about them too, but I'd had no signal all day. By 17:00 I was arriving at the Piazza del Popolo in Levanto and the end of the days walk and 31km walked.....all in shorts and T-shirt in January. 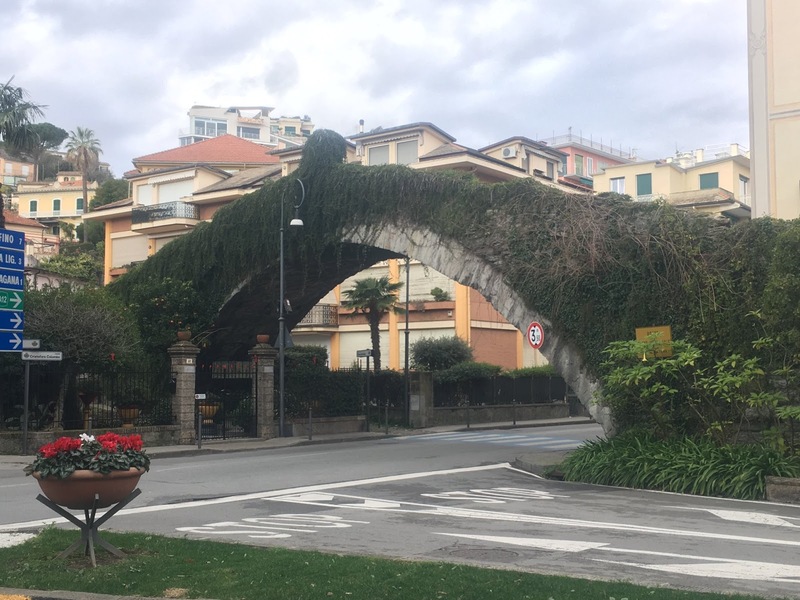 I asked a local if he could show me the way to the Piazza where my hotel was situated, he pointed across the road and as I arrived at the doorway, Claire rang to say she'd just arrived too. Well a very hilly day today from Sarzana to the medieval village of Caste, perched on a hill on its own. Total population 15. The route initially took us along a very busy road where we took shelter behind a crash barrier for 1km before leaving it in the distance. We've walked along cobbled pathways and up and down steps carved in the ancient woodlands as we passed through villages and hamlets. Just after midday after a strenuous ascent we were rewarded with a stupendous view across the city and gulf of La Spezia called the Poets fountain. 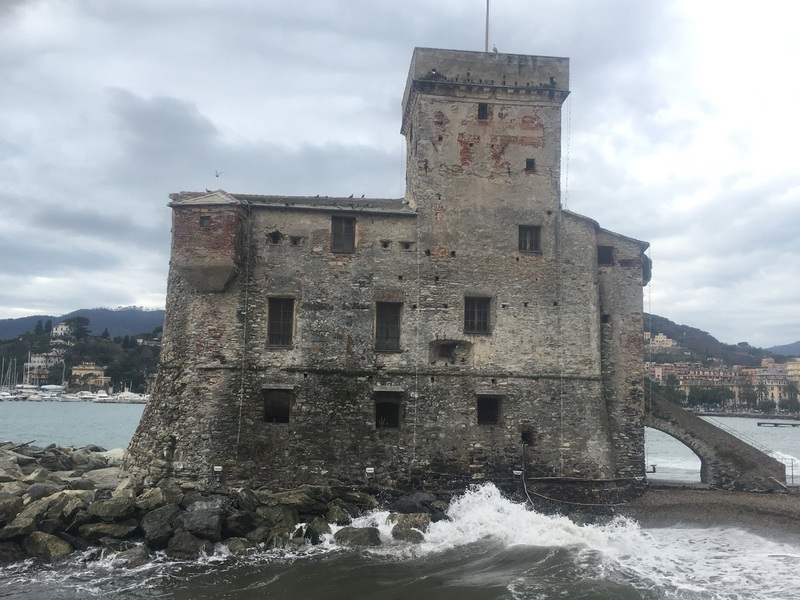 After we passed through the hamlet of Straw we once again ascended the hillside to the church of Pieve di Santo Stefano, now currently undergoing restoration, but in the Piazza we were once again rewarded with an unspoilt view over La Spezia. 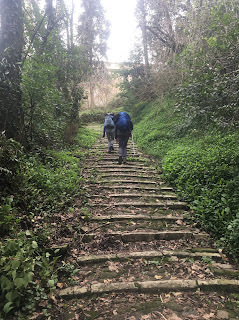 The final part of the day saw us descend down an ancient stairway and through a small wooded valley before final crossing a Roman footbridge to reach Caste. Our accommodation is on three floors and shaped like the letter L. One room at the bottom and three bedroom at the very top. It's old, rustic and belongs to an artist and is suitably dressed and adorned with his artwork on the fabric of chairs and pictures. The middle floor has the original frescoed ceiling. After 24km, a bottle of the local red wine and a scrumptious simple meal because I had to carry the ingredients in. We all settled down to relax and were in bed by 9.15pm. Well after a long day we've arrived and as three Pilgrims we will walk the 29km to Sarzana in the morning. This will be the second stage of the new St Augustine Way - A Gregorian Mission. The route starts in Rome and finishes at Canterbury Abbey and will be launched in 2019. We will be walking for 2 weeks along the Via Della Costa to Menton, then I'll be on my own following the Via Aurelia to Arles. 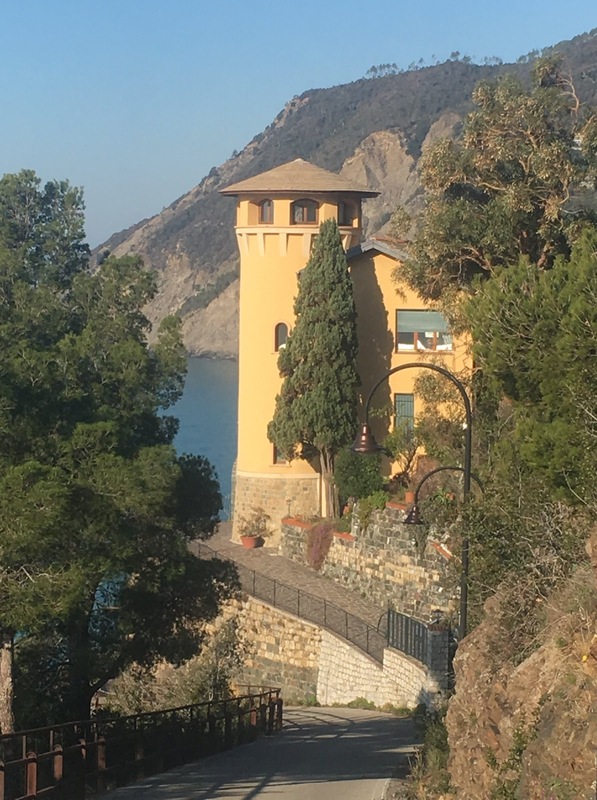 An early start from Massa to Sarzana today - 29km although it is possible to make it shorter during the tourist season and accommodation is more available. The route took us through terraced vineyard high above Massa passing Roman and Medieval architecture and marble factories along the way. The weather was 15 degrees and sunny, perfect for shorts.....maybe tomorrow. Today I saw my first Coypu swimming in the canal just outside Sarzana. The day ended with a walk up to the military Fortress Sarzanella that overlooks the town and a cold beer in the Piazza.